I love golfing with my Dad. It's the only time I really golf. We do a lot of golfing when Mom and Dad visit us in February as a part of their escape from the cold and snowy winter in Pennsylvania. And we do a whole lot more of it when we go up north as a part of our escape from the heat of the West Texas summer. My most favorite golf outings during the summer are with Dad, my brother Cliff, and my brother-in-law Mark. Great, great memories over the years, the four of us golfing together. Can't wait to tee it up with them in a few months. Brenden, my oldest, you might have surmised if you follow these Friday posts, is very into athletics. Aidan, my youngest, not so much. But during the fall Aidan expressed interest in joining the ACS golf team in this his freshman year. So during Christmas Santa left some golf clubs under the tree. 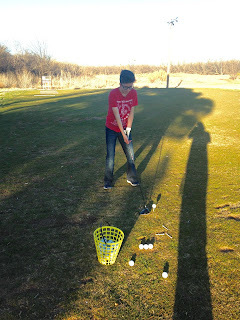 Aidan hadn't ever played golf before, so before the golf season began I took him to a driving range. We got two big buckets of balls and we started out working on the basics of the golf swing. The picture here is from that day. Golf season started and Aidan is having a great time. He's new and just starting off, so he's got lots to work on. His first tournament was a struggle, but in the next two he played he brought his scores down. There is one more tournament left this year. Go Aidan! Go Panthers! All that to say, we're so proud of Aidan for trying something new and sticking with it. And the biggest upside? Years of golf ahead with Brenden, Aidan and I. Just like I've had with my Dad.